Created by The Saucy Fish Co. with a Spanish tapas-style twist and finished with a buttery sauce, simply bake the foil bag in the oven for an instantly impressive seafood dish. This natural, preservative-free mix of ruby chard and lambs lettuce will complement almost anything, while also adding an additional burst of colour to the plate. Get perfect fluffy rice in just two minutes: pop the bag in the microwave to gently steam the rice, open and serve alongside your main. A little pot of heaven to share when almost full, Pots & Co’s Salted Caramel and Chocolate Pot is a wickedly indulgent way to end the meal. It comes in a beautiful ceramic ramekin that you can use again, too. Place an order worth £40 or more, for delivery before Friday 6th March. Final delivery date: Thursday 5th March. Add the voucher code VOU9040750 as you check out. 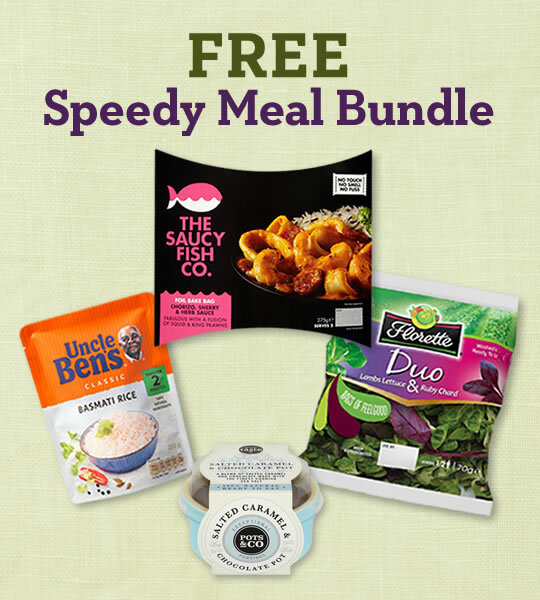 This entry was posted in Freebies, Talking Ocado and tagged chocolate pot, Dessert, Florette, Freebies, giveaway, microwave rice, Pots & Co, Quick Food, salad, Speedy Meal Bundle, speedy meals, The Saucy Fish Co., Uncle Ben's by Ocado. Bookmark the permalink.